VLADIVOSTOK, May 16. /TASS/. 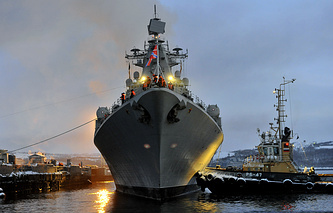 The flagship of Russia’s Pacific Fleet, the missile cruiser Varyag arrived at the Changi naval base in Singapore on Tuesday morning to participate in the ImDex Asia 2017, the official spokesman of the Eastern Military District for the Pacific Fleet, Vladimir Matveyev told TASS. "The cruiser Varyag moored at the Changi naval base of the Singaporean Naval Force on Tuesday," he said. "Access to the ship for delegations of the participating countries will be open for the next three days in the framework of ImDex Asia 2017 international exhibition of naval weaponry and combat equipment." A detachment of ships of the Pacific Fleet consisting of the Varyag and the tanker Pechenga left the port of Vladivostok on April 1. On the way to Singapore, it called into the ports of Busan, in South Korea, Manila in the Philippines, Cam Ranh in Vietnam, and Sattahip in Thailand. The main objective of the mission is to demonstrate the St. Andrew’s Flag in Asia and the Pacific and further development of naval cooperation with the countries in the Pacific Asia region.